Our vast experience in fibre ropes allows us to bring you the best advice and the right equipment for your project. While natural fibre ropes such as hemp, manila and sisal are still in use, they have in large been replaced by man-made fibre ropes using synthetic materials. Synthetic ropes are generally manufactured from nylon, polypropylene, polyester or a combination. The ropes are constructed in either a three strand hawser, eight strand plaited or braided. Although other constructions are available, the afore mentioned three are the most prevalent. Fibre lines are much more flexible than wire rope though do not offer as high tensile strength. Three strand hawser laid rope is a multi-purpose rope used for many different types of tasks. Eight strand plaited rope is generally used as vessel mooring and winch ropes. 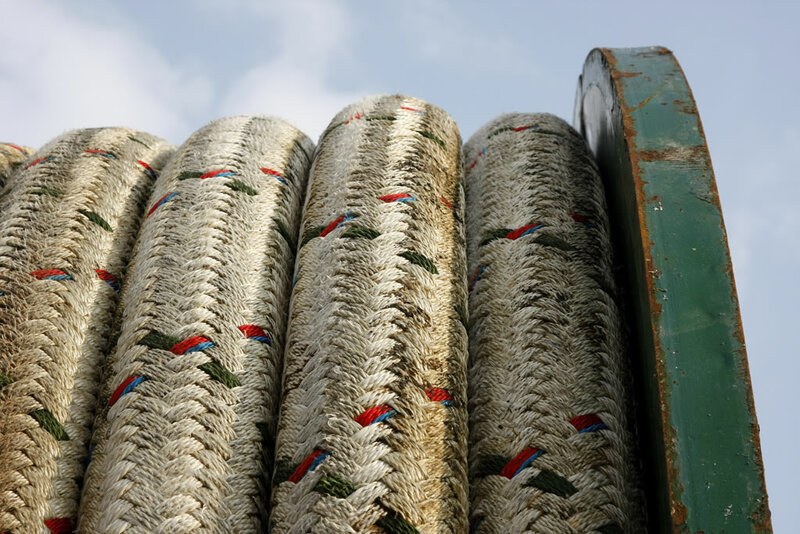 More modern materials such as Kevlar, Arimid and Dyneema threads can be added to the above ropes to provide different characteristics such as high strength operations. Circumference is often used to express the size of a rope and standard coils of rope are 220 metres long. Whatever your project requirements, simply contact us and we'll give you all the information on special mooring ropes you'll ever need.